A secret network of tunnels 100ft (30m) under central London has gone on sale. 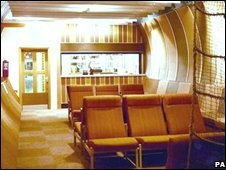 The Kingsway Tunnels were built in 1940 as deep air-raid shelters which could accommodate 8,000 people. They have since been used as a public record library and a telephone exchange. The Post Office took over the tunnels after World War Two. Now its successor, BT, is selling the 77,000 sq ft of space, and the firm hopes the sale could attract offers of about £5m. Access to the mile-long system of horizontal and vertical shafts is through unmarked doors in the street on High Holborn. The site is fully equipped with electricity, water supply and ventilation equipment. The tunnels once housed the telephone exchange which connected the Cold War hotline between the presidents of the US and USSR. BT put the site up for sale in 1996 but failed to find a buyer, but now the company hopes to find a government department or large company to move in and make the site productive again. Elaine Hewitt, group property director for BT, said: "We are looking for a purchaser with the imagination and stature to return the tunnels to productive use. "The site has the most fantastic history and, now that we have no requirement for it for telecommunications use, it is right that we should offer it to the market." The unique nature of the site means it is unsuitable for conversion into a hotel or office, BT said.